Lerici is the place where you can practice surf and enjoy romantic views. If you want to enjoy a romantic night out in the area, Lerici is probably one of the best options, thanks to the picturesque colorful streets and buildings, together with the majestic view of its castle at night and the beautiful sea. Lerici is the town located at the eastern edge of the Gulf of La Spezia, or Gulf of Poets. It is an important historical town in the area, which had a strategic importance between the Lunigiana territory and the coast in ancient times. Both Lerici and the close village of San Terenzo were quite populated already in Medieval time, when they were a natural access to the sea from the main transit routes coming from northern Italy through Parma and the Lunigiana valley, and a strategic borderline between Genoa and Pisa military and commercial territorial jurisdiction. Many wars alternated here to establish power also in the following centuries. The imposing presence of the beautiful castle from which the control of the whole bay stretch of water is the main witness of Lerici’s historical importance. Visiting the castle will give you a glimpse on the history of the whole area as well as one the most beautiful views of the Gulf of Poets, for which name Lerici actively contributed: Percy Bysshe Shelley and Mary lived here, as well as Mario Soldati and other major poets. Lerici beaches are among the most popular in the area, where you can practiece surf thanks to its sandy shoreline and larger spaces. The Venere Azzurra and San Terenzo’s, which are free, are among the most popoular locally, then you have a few offering sun umbrella and chairs rental for about 15€ and good facilities, especially for families with kids, but also for being ideal to enjoy a nice day and evening out on the beach, thanks to the bars on the shore. If you are a more typical rocky Liguria lover, from Lerici you can easily reach the nearby beaches of Fiascherino (free) or Baia Blu (with entrance ticket). By car: from La Spezia, taking the junction that leads to the highway, you will find a detour to Lerici, a direct road to Lerici in minutes. You can also take the slower road through several villages before reaching Lerici. The village of Lerici and also to San Terenzo are closed to traffic of non-residents during the tourist season. There are several large parking lots to park before entering the city. By ferry: the ferry service provides a service to Lerici only from Portovenere. Please visit our updated ferry schedule. By bus: buses to San Terenzo and Lerici from La Spezia are very frequent. By the majority of the stops of the city center, the L bus passes with a frequency of about 20 minutes, and it takes more or less the same time to get to the fishing villages. 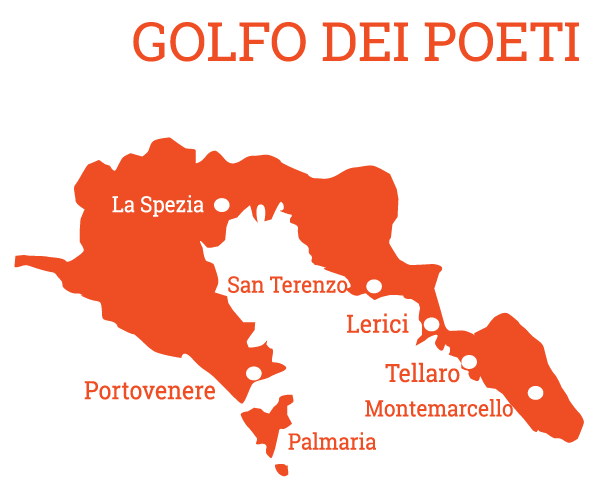 The castle of Lerici is located on the “poggio“, a natural hill at the highest point of a small promontory that overlooks the sea and offers the most evocative view of the Gulf of poets. The history of the construction of the castle, and with it the port and the town, is still uncertain. It seems that the first version of the castle was a watchtower built to defend the Ligurian promontory from frequent enemy attacks. The castle has been the subject of many struggles because it was considered a very important point of sighting and in a strategic military position, in particular between the two Maritime Republics of Genoa and Pisa, among which was the castle. In 1256 the castle was conquered by the Genoese and later expanded and reinforced. A plaque, still visible, was placed at the entrance to seal the event. In the following years Lerici was the scene of struggles between Guelphs and Ghibellines and, twice, one in 1320 and one in 1326, the village of Lerici was set on fire by the Guelphs, but the castle was never conquered. During this period the castle began to be used as a prison for the enemies of the Republic of Genoa and, in general, of the dominating factions. In 1426 Lerici passed to the Spanish Aragonese, who promptly created a powerful guard around the castle, but the people of Lerici, tired of constant harassment, succeeded in defeating and hunting the Spaniards from the village in 1437. Later, in 1491, Lerici passed under the domain of Florence. This provoked the ire of the Republic of Genoa that managed to conquer the castle of Lerici thanks to the help of a Florentine traitor. During the sixteenth century the castle, which in its long history was used in all possible ways (storage, armory, prison), gradually lost its strategic and defensive importance, while remaining in arms against possible enemy attacks . Lerici also expanded outside the narrow walls of the village to become a small port city with a flourishing economy. The castle remained thus also during the eighteenth century, when Lerici became a tourist city. The castle is entirely built on a pentagonal base: the entire building and the shape of the tower, protected externally by a massive curtain of walls. To further defend the castle, which can only be accessed through a door located to the west, the Pisans built a drawbridge whose slots for sliding are still visible today. From the entrance, with a flight of stairs, you reach the first floor where one of the most prestigious local structures is the chapel of Santa Anastasia, with its vaulted ceilings and well-preserved decorations, in typical white marble and black stone, characteristic of the local Gothic style of the XIII century. An old brick vaulted dome oven, certainly used to cook food for those who lived in the castle, was discovered during the restoration work in 1997, in the western spur. The second floor of the castle, which in past years was used as a youth hostel, has been restored by redoing the roof as it was originally, according to the testimony of found documents. From here, through two exits, you reach the paved terrace with sandstones. The Castle is occasionally closed to the public for private or public events or due to extraordinary maintenance. Please check opening hours on 0187 969042 or e-mail info@castellodilerici.it. The reductions are aimed at: military, children aged 6 to 13, adults over 65, students and disabled, groups of 10 adults.